About a year ago, when I started blogging, I also started reading Sarah's blog. I quickly discovered that she lived in Davis, the town we had just moved from a few months earlier. We loved living in Davis for the six years we were there while Ryan went to graduate school at UC Davis. It has the best farmer's market, bike paths down every street, wonderful weather (ok, except for those couple weeks in the summer when it's 110), green living, fun people, great parks, double decker buses, lots of fun things to do - am I painting the picture for you? We really did love it there! It was a great place to spend six years. Earlier this year we thought we might try to get back to Davis for Picnic Day, but for several reasons we just weren't able to go. Instead we went to visit our family and Ned got sick and threw up all day on Friday and we had a tiff with Ryan's brother (I cringe to even mention this because it is so not like us to argue with family - this is really the first argument we've had with anyone in either of our families since we've been married) and basically our weekend didn't turn out very well. We came home early and spent Sunday recovering. And then on Sunday night, I started seeing pictures of Picnic Day on blogs of friends and I started feeling sorry for myself. And then on Monday I went to get the mail and there was a key in our box. Keys mean packages and I wasn't expecting one. I opened up the door on the mailbox and found a box from Sarah inside. She had told me a while back she would send me a Davis care package - something that I had totally forgotten about until I saw it. And her timing was perfect - just the thing to cheer me up when I was really missing Davis! 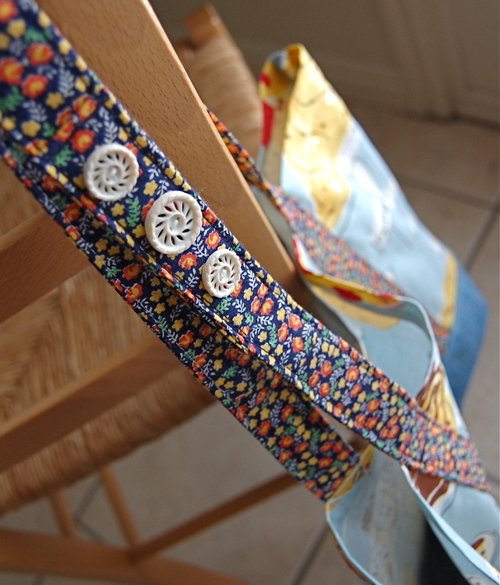 She sent a great tote, made by her (take a look at that fab button detail on the strap -love it!) 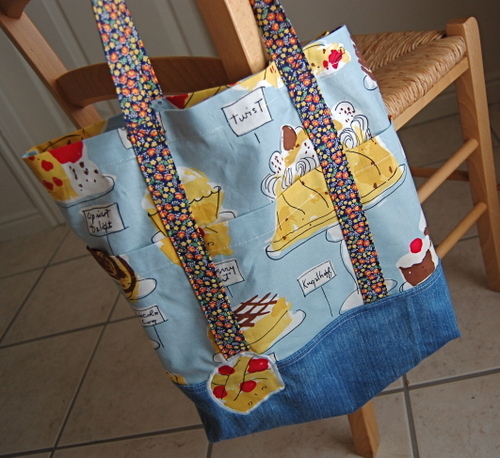 - such fun fabric and excellent workmanship - french seams inside and super straight stitches. And she sent another tote bag from the absolute best grocery store in which I will proudly carry my groceries. Also included were an assortment of treats from Pedrick's Produce - the best produce stand/store in the area -cheap as dirt and fresher than fresh. My only regret is that I didn't discover this gem until we'd been living there for about four years - I'm not sure how I missed it! 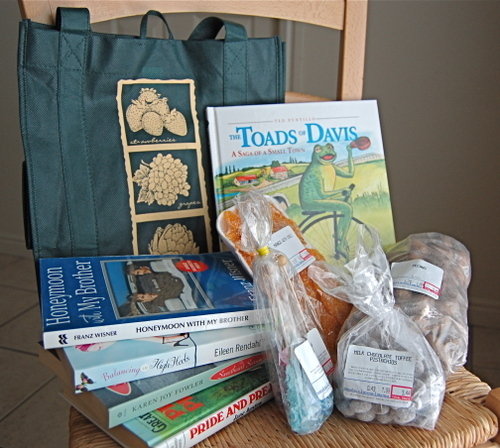 And the books -assorted fun reads and "The Toads of Davis " - one that we always meant to get and never got around to it. How can you leave Davis without a copy of "The Toads of Davis"? Thank you so much Sarah - perfect timing and the perfect package - you really made my day! And I keep smiling every time I see it - so I guess you made my week too! and p.s. Revolution Money Exchange is extending their offer until May 15th - everyone who signs up gets $25 and each referral gets $10. I actually had someone pay me with it last week - it worked well and so far I'm happy. I don't expect to use it much at first, but hopefully it will gain more popularity and I won't be paying so much of my hard earned dough to PayPal. Sorry your weekend didn't turn out as you planned. What perfect timing though with that package your friend sent you. We didn't get to Picnic Day, we actually talked about going this year, unfortunately, someone was working:( The wiener dog races will have to wait! Isn't it nice getting mail from friends? Just so you know, your blogger profile link took me to your old blog. Why did we ever leave? Why? Small world! We spent five years in Davis while Dave was getting his PhD in Entomology. We actually lived a time in Yuba City, while I was teaching high school there. Our son, Liam, was born there. A special time. What a nice treat. I love when that happens. Very small world! I live in Woodland! I found your blog because Amy (?) over at Motherload linked to your peanut butter recipe. I'm up later than usually tonight waiting on people and thought I'd scroll around blog-land. I get to the post on my blog about your PB and get to your current page and see we were neighbors! I unknowingly went to the farmer's market on Picnic Day a few years ago. My mom, small son and I set out for a few hours of leisurely strolling through the market and ended up leisurely strolling to the Davis PD office to get my car out of hawk from the tow company who kindly moved it for the nice people of Davis when I parked in a, clearly? ?, marked no parking zone! *BIG EYE ROLL* West Sac impound lots are so much fun on a Saturday afternoon. Thanks to freecycle.org and a wonderful giver of baby items, I ended up in Davis again, unknowingly, on Picnic Day and ended up being re-routed off of I-80 when I missed my exit. I'm so glad you loved it in Davis. It sounds truly lovely and I'm now extra disappointed we never made it out to visit you. I hope you don't wilt too much in Chubuck (you HAVE to love the name, at least!) I'm sorry you missed Picnic Days. Big Hug!! What a sweet, sweet package!